We are so lucky to be alive while Katherine Rundell is bringing out her extraordinary children's books. I lay in bed till past midnight last night reading The Explorer. I saved the final few pages till this morning, not wanting the book to end. It is the best children's book I have read since Rooftoppers, and so beautifully written and confident. You feel in very safe hands - this is the work of a writer who knows her craft and who draws you so strongly into her world you can hardly bear to leave but want to start reading all over again. It is not just a 'message' book, but it does have a very strong message - to pay attention to the world and to the people we meet, because attention is life and love. To be brave because we all can do so much more than we think. To face our fears and overcome them. She is totally unafraid of dealing with problems and never talks down to her audience. 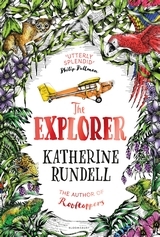 I look forward to many more unexpected and wonderful novels by Katherine Rundell.